A School of Medicine, University of Los Andes. Santiago, Chile. Medical student. B Public Health and Epidemiology Department, University of Los Andes. Santiago, Chile. Physician and Doctor in Public Health. C Servicio de Salud Mental, Clínica Universidad de los Andes. Santiago, Chile. Médico Psiquiatra. D Mental Health Service, University Clinic of Los Andes. Santiago, Chile. Psychiatrist. E Psychiatry Unit, Coyhaique Regional Hospital. Aysén, Chile. Psychiatrist. F Psychiatry Service, Hospital of Puerto Aysen. Aysén, Chile. Psychiatrist. H Sub department of Management and Development of the Network, Aysen Health Service. Aysen Chile. Health-related quality of life (HRQoL) deterioraton is a risk factor for suicide in adults, however, this aspect has been little studied in adolescents. To evaluate the asso ciation between HRQoL (measured with EQ-5D-5L) and suicidal risk in adolescents and its capacity for cross-sectional detection of suicidal risk. 128 adolescents (15-19 years old) from Puerto Aysen (Chile) responded to the EQ-5D-5L questionnaire, the Okasha Suicide Scale and two anchoring questions of imminent suicide risk. A suicide risk case was considered to have a > 5 score on the Okasha scale or the affirmative answer to one of the anchoring questions. The index value of EQ-5D-5L was calculated and Odds Ratios (ORs) were estimated with confidence intervals (95% CI), adjusted for confounders. Areas under the ROC curve (AUC-ROC) were calculated to assess the discriminatory performance of EQ-5D-5L. 21 (16.4%) adolescents were at suicidal risk. Controlling for confounders, the EQ-5D-5L dimensions associated with suicidal risk were pain/ discomfort (OR: 2.5; 95% CI 1.1-6.1) and anxiety/depression (OR: 2.2; 95% CI 1.3-3.6). The AUC- ROC for both dimensions was 85% (95% CI 0.75-0.91) and 81% for the EQ-5D-5L index value (95% CI 0.72-0.89). HRQoL could be a risk factor for suicide in adolescents and in this way, the EQ-5D-5L could help in searching for high risk and hidden cases of suicidal risk. Adolescent suicide (15 to 19 years) is a priority for the Chilean Public Health. The higher rates are localized in the south of Chile, especially in the Aysén Region1. If preventatives actions are not taken, according to the projections estimated of the Ministry of Health for 2020, the rates of this age group will increase by 39%. In this regard, awareness of the risk factors and the availability of cost-efficient tools for screening at risk are essential to prevent and create specific interventions. Depression and previous suicide attempts are the major suicide factors, however, the evidence indicates that there are differences in the risk profile among the different age groups, such as self-inflicted lesions (with or without suicide intention) and behavioral/psychological alterations are the pincipal factors in adolescent2-5, while in adults and elderly adults, chronic diseases and health-related quality of life (HRQL) are the most common factors2,6. In Chilean adolescent and young people, the most reported factors are depression, family dynamics7, alcohol consumption, impulsivity8 and previous suicide attempts. In this same age group, the HRQL10 re lated with depression or as a result of suicide prevention interventions11 was evaluated, however, the HRQL has not been taken into account as a suicide risk factor in adolescents since it is an age group chronic or disabling diseases are less frequent. The HRQL is a multidimensional construct which includes physical health, psychological health and social valuation of both, which can be easily measured through short and validated instruments such as the EQ-5D-5L questionnaire. Even though there are specific question naires for investigation and stratification of the suicide risk at a community or individual level12-16, only the Okasha suicidality scale is validated in Chile17. Also, suicidality scales do not consider that 66% of the victims do not communicate their plans or suicide thoguhts18. Thus, secondary suicide prevention (early detection of an adolescent in risk and hidden cases) can be impro ved with the inclusion of simple and widely used tools that address suicidality indirectly. We hypothesize that HRQL is related to suicide risk (attempt, ideation, and self-aggression) in adolescents since an auto-percep tion of a physical or psychological health deterioration would be a mediator between previous anxiety and sui cidal behavior19,20; therefore, the EQ-5D-5L would have an adequate performance tool for screening hidden adolescents suicide risks in the community. A transversal case control study, nested to a cohort of suicide risk adolescent investigation named RADAR (Red para la Atención y Derivación de Adolescentes en Riesgo Suicida), was performed,. During 2016, two out of six high schools in the commune of Puerto Ay- sén RADAR was implemented as a proof of concept. A municipal school and a private subsidized school were chosen, both with the lower scholar vulnerability assessment of the Sistema de Asignación con Equidad (IVE-SINAE) de la Junta Nacional de Auxilio Escolar y Becas (JUNAEB). According to JUNAEB data, the admission for 2015 was 905 students (362 municipal and 543 private subsidized) and the IVE-SINAE of the municipal school was 80.6% and 52.7% in the private subsidized school21. During April 2016, 128 adoles cents and parents/tutors signed the consent form and were included in the RADAR investigation system, answering voluntarily the Okasha suicidality scale17, two imminent suicide anchor questions, the EQ-ED- 5L with previous written consent from the Research Foundation EuroQol and the Adolescent Risk-Taking questionnaire (ARTS)22, among others. The questionnaires which were included in RA DAR were transversally auto-administrated through a web platform (www.vivavivir.cl) with an approximate duration of 30 minutes. The Okasha suicidality scale is composed of four items, where three address suicide ideation in different intensities; ¿Has pensado que la vida no la pena? ¿Has deseado alguna vez estar muerto? ¿Has pensado alguna vez terminar con tu vida?. And the fourth item is rela ted to previous suicide attempts: have you ever tried to suicide? Each item is answered in an ordinal scale codified from 0 to 4 points (never, hardly ever, some times and many times), a total score from 0 to 12 can be obtained with the sum of the points of each item. Since this Okaska scale measures past suicde ideation and attemps, two anchoring question of recent suicide risk created bya group of professional experts on suici de were included: have you ever thought about ending your life in the last two weeks? Have you thought on self-damaging you in the last two weeks (cuts, burns or hits)? A “suicide risk case” was defined with a total Okasha score higher or equal to 5, or to an affirmati ve answer to any of the two imminent suicide anchor questions. Control patients were those who had a score lower than 5 and gave a negative answer to both anchor questions. The auto-administrated version of the EQ-ED-5L scale, validated in Chile to measure the HQRL23,24 was used This scale consists of two parts, the first one mea sures the health status through five dimensions (mo bility, self-care, uual activities, pain/discomfort and anxiety/depression), each dimension has five answer levels which were addressed in an ordinal categori cal scale: without problems, mild problems, modera te problems, acute problems and extreme problems. With the health profile of these dimensions, the “index value” of the EQ-ED-5L was calculated, the combina tion of standard values used in this index was from the United States since Chilean population values are not available in the Research Foundation EuroQol. This index indicates the health status of people, which vary from zero points “death” to one point “perfect health status”, in a continuous quantitative scale. The second part of the EQ-ED-5L, called “EQ-VAS” measures the self-judgment of the person with respect to their own health status, it is recorded in a continuous quantitati ve scale, being cero “worst health” and a hundred “best health” they can imagine, in this case, the adolescent. From the ARTS’25, questions related to the control of potential confounder were used; ‘physical health problems report’ (dichotomous scale), mother’s edu cation level (as a substitute of the socioeconomic le vel in the ordinale scale: primary, secondary and high education) and history of alcohol/drugs problems (dichotomous scale). In order to compare categorical variables between cases and controls, the Fisher exact test was used, since absolute frequencies lower than 5 were observed and the Mann Whitney test in the case of quantitative variables with asymmetry in its distribution. P values lower than 0.05 were considered significant. Crude Odd Ra tios (OR) and adjusted OR by confounder, with their respective 95% confidence intervals (CI95%) were estimated withlogistic regression models. The area un der the ROC curve(AUC-ROC) with CI95% with the nonparametric method was calculated to evaluate the performance of the EQ-5D-5L and to determine the cut-off point of each dimension for a better sensitivity and specificity. The study protocol was reviewed and approved by the Scientific Ethics Committee of the Universidad de Los Andes and of the Aysén Health Service, following Belmont and Helsinki principles. 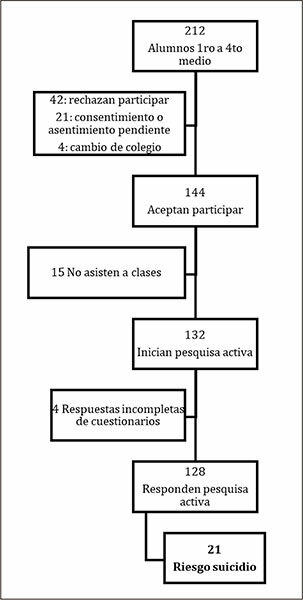 From the 144 adolescents that accepted to partici pate, 128 completely answered the RADAR questionnaires and 16.4% (21) were classified as suicide risk cases (Figure 1). Figure 1 Recruitment flowchart of the study population. Table 1 indicates that the mean of age was 15.9 years (SD 1.2), 50% of the population were females, 19.4% reported previous alcohol/drugs abuse and 54.3% phy sical health-related problems, there were no significant differences between cases and controls. The 5Q-5D-5L index value was lower in cases of suicide risk than con trol patients (0.74 versus 0.85; p<0,001) (Table 1). Table 1 Characterization of the study population. Table 2 shows the association between physical health problems, the different dimensions and 5Q-5D- 5L scores, and suicide risk. The dimension of pain/ discomfort in the health status of 5Q-5D-5L showed a significant association with suicide risk, even though after adjusting by physical health problems, mother's education levelsand alcohol/drugs problems (OR: 2.5; CI95% 1.1-6.1). However, the EQ-5D-5L index value showed an inverse association with suicide risk (OR: 0.02; CI95% 0.002-0.2). The dimensions of mobility, self-care, and usual activities did not show any signifi cant association (Table 2). Table 2 Odds Ratios and 95% confidence intervals (95%CI) for the association of physical health pro blems, EQ-5D-5L and suicidal risk. Regarding the performance of EQ-5D-5L for the screening of adolescente at suicide risk , the dimension pain/discomfort, at a cut-off point higher or equal to two showed a 72.2% sensibility and 65.0% specificity (AUC-ROC: 0.71; CI95% 0.58-0.84), the anxiety/depression dimension showed a 94.7% sensibility and a 75.2% specificity at the same cut-off point (AUC- ROC: 0.83; CI95% 0.75- 0.91); the EQ-5D-5L index value showed a 81% sensibility at a cut-off point lower or equal to 0.2 (AUC-ROC: 0.81; CI95% 0.72- 0.89) (Table 3). When evaluating the performance of both dimension together, pain/discomfort and anxiety/ depression, through a multivariate logistic model, the AUC_ROC was 0.85 with a significant model ad justment (value p<0.01) (Figure 2). Table 3 Performance of the EQ-5D-5L scale as a screening tool for suicide risk in adolescents. Figure 2 Area under the ROC curve (AUC-ROC) of the pain/discomfort and anxiety/depression dimension of the EQ-5D-5L questionnaire for suicide risk screening. Multivariate logistic model. Our results indicate that the health status measured by dimension pain/discomfort and by the 5Q-5D-5L index value were associated with suicide risk in the stu died population; that is, the lower the valuation of the health status or the higher the pain/discomfort in the health status, the higher the risk of suicidal behavior in these adolescents. These findings where similar to those reported by Kim et al.6 in high school Mexican adolescents; even though the quality of life was evalua ted globally and not specifically related to health. The HRQL measurement through only one numeric index, as the 5Q-5D-5L index value, not only allows to mea sure the social valuation of the population physical and psychological health status but also to contribute economical evaluations in health27. In this context, the so cial valuation of the physical and psychological health of the adolescents was high but significantly lower in those who reported suicidal behaviors, independently of the presence of any disease. Our results also demonstrated that the index value showed a good level of sensibility to screening adolescent at suicide risk at a population level, but a lower cut-off point than adults6. This capacity to discriminate was similar to the Okasha suicidality scale17, even though it presents better specificity values (79%); and to other scales that address suicide directly, such as the Columbia-Suicide Severity Rating Scale28, which has an 88% sensibility and 72% specificity; and the STOP- SAS16 scale with similar values. After including the HRQL construct in this study, it allowed to directly address not only the mental health sphere but also the physical health valuation and the self-perception of the health status of the adolescents in this study. In this regard, and how it was expected, the anxiety/depression dimension of the 5Q-5D-5L had the strongest association, even after adjusting by confounder. On the other hand, the pain/discomfort dimension also related to suicide risk, even after adjus ting the physical problems/diseases report; despite ha ving considered this last medical report by ARTS, it is not possible to dismiss the presence of physical pain29, which can be secondary to a physiological alteration or disease, or psychological pain (mental) in the context of depression and anxyety19,30 of this population. Apart from that, the report of having mild problems (cut-off point > 2) in any or both of the previous dimensions would indirectly suggest a risk behavior in the adoles cent. This is the first time that a prevention intervention and measurement of the risk factors is performed in a commune with high rates of suicide in adolescents, in this context, our results are exploratory and require a validation in a representative sample of the popula tion and with an epidemiologic design with tempora lity. Lastly, one of the advantages of using 5Q-5D-5L in the investigation is that this questionnaire does not directly address suicidality; can be self-administrated and takes approximately seven minutes to complete, and therefore, it would have a better acceptability in the commune. Financial Disclosure: CORFO of Social Innovation Aysen # 15IS-46638. Acknowledgments: To the Health Service of Aysen and the schoolar com munity of Puerto Aysen who made this study possi ble.